On Thursday, October 22, 2015, International Student House of Washington, DC held our annual Global Leadership Awards Dinner. 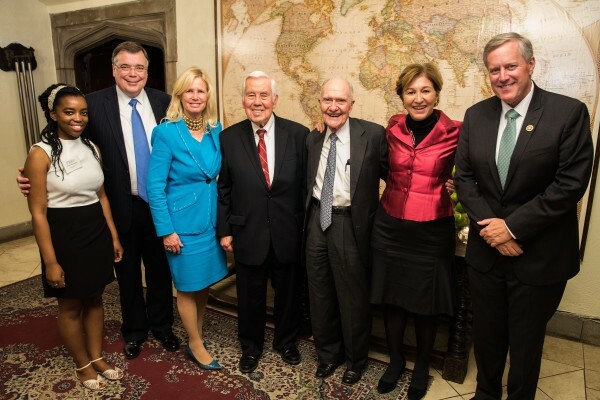 Members of Congress, Ambassadors and embassy representatives of 18 countries, and members of the business and philanthropic communities gathered to honor three outstanding individuals for their commitment to international understanding and to support the House. We honored former US National Security Advisor, Lt. General Brent Scowcroft with our Global Leadership Award for his outstanding achievements to promote international understanding and cooperation. Former Senator from Indiana and recipient of the 2014 ISH-DC Global Leadership Award, Richard Lugar, presented a stirring tribute to General Scowcroft. We also recognized Dr. Anne-Marie Slaughter, President and CEO of New America with our Global Educator Award for her commitment to international education and understanding. Rear Admiral Susan Blumenthal, MD, Former US Assistant Surgeon General, presented Dr. Slaughter with the award. The gala was made possible through the generosity and commitment of our sponsors, ISH-DC Board of Directors, and our Awards Dinner Committee and its Chairs. Jan Smith was our Awards Dinner Chair. Representative Mark Meadows (R-NC) and his wife Debbie served as this year’s Congressional Chairs. Ambassador Kenichiro Sasae of Japan and Mrs. Nobuko Sasae served as Diplomatic Chairs. We are deeply grateful for their support.